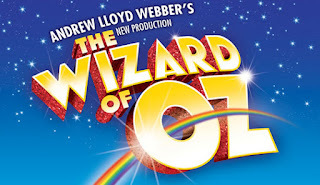 Last night Roger, Stuart and I went to see The Wizard of Oz at the London Palladium in London's glitzy West End. We had fairly low expectations to be honest. And they were barely met. Russell Grant as the wizard was just plain awful. He can't act. He has no personality. OK, he can sing a bit, but there's more to the role than that. We seriously hoped he'd not be the one to make it back to Kansas. One of the main issues to be tackled with the The Wizard of Oz as a show is whether it's a pantomime or a straightforward musical. Wicked gets it just right - this production plain doesn't. It's neither fish nor fowl. It not only fell between two stools it died when it hit its head on the floor. At the interval we took the Yellow Brick Road to the bar - but got stung £29-10 for three drinks. Ouch! Back for the second act things picked up a bit. The Wicked Witch of the West had the best tunes and flying around the auditorium a la Mary Poppins was fun. Talking of flying though the monkey's where menacing enough and there weren't enough of them and took way to long to attach the harness wires to Dorothy. Oh, and the 'actress' playing Dorothy was so vacuous we couldn't really begin to care about her fate (which is rather central to the plot don't you think?) Rainbows are too good for you, love. Stick to rep. The Scarecrow, Tin Woodman and Cowardly Lion gamely did as best they could but no number of "friends of Dorothy" gags could save this magic-free show.